This Psalm of Life medley as recorded by Alan Stockwell at Soundesign in Brattleboro, VT and mixed with Davy Galant at Chemin 4, Joliette, Quebec. It was produced with Denis Fréchette. We consider the song a truly democratic call for engagement - we are left to choose our path of our own. Only passion is required. "If people are unwilling to make a basic commitment to the physical health and well being of each other, there seems little to hold a community together. Universal health care should be considered a public good and our primary patriotic duty." Drawing on strands of traditional fiddle music from eastern Canada and New England as well as their Old World counterparts, Nightingale artfully weaves a blend of old and new sounds in their arrangements of an ageless music. 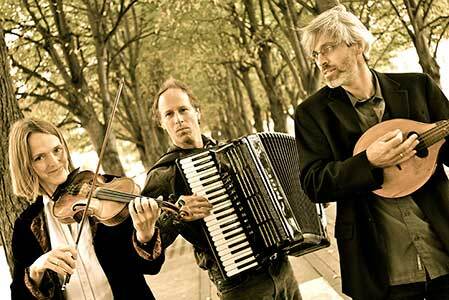 The instrumental core of the ensemble consists of fiddle, accordion, guitar and French Canadian style foot percussion while their songs span both English and French Canadian traditions. Their arrangements and ensemble playing have set a new standard in the world of northern traditional music. Four recordings reflect Nightingale's musical depth and sensitivity. The band is based in southern Vermont and has toured widely since the early 1990s. Visit CDBaby to purchase Nightingale's CDs.